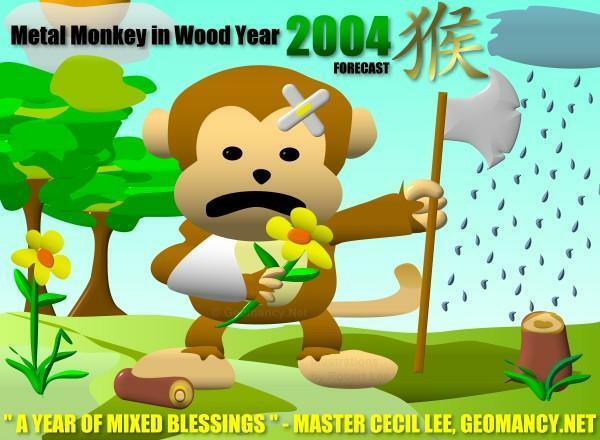 2004 is the Year of Monkey, where the Heavenly Stem of the Year is Wood while Earthly branch is Metal. When Metal Monkey attempts to chop tress, the monkey has both gains and injuries. So some difficulties can be expected.Learn more about what Cecil has to say about this illustrated forecast! Those born in the year of Monkey and Tiger are said to be in conflict with the Tai Sui (Grand Duke). So these two groups should be extra careful in 2004. Rat has to look after mental health, finance. Little luck. Other people will take caution with the rat person. And the rat person should use his/her charm, throughout the year to overcome this. Remarks: Generally a good year. Remarks: Look after health & avoid investments. Generally a good year. Things will go smoothly. However, must avoid becoming too rash so as to avoid getting into trouble. Very likely that there is romance luck and promotions in career. A very good year for business opportunities or starting a new business venture. Remarks: A favourable year for finance. Remarks: Be careful of accidents. Good Romance Luck. Remarks: Mix-blessings, look after health. This year is like a toothless and defenceless tiger. Tiger & Monkey Clash expect lots of problems (losses and very little monetary gain) ie finance issues. Close to the year end, expect to meet some "nobleman" luck to help the tiger. Not good for starting business. And may have lots of quarrels and relationship issues. Try to control temper. Remarks: Be careful of finance. A very auspicious year for the rabbit. Generally a good year in career and health. Good chance for unmarried Rabbit to encounter some potential romance. Good career luck throughout the year. A year of mixed-blessing. Be careful of outdoor sports related activities. If making investments avoid high risks. Adopt a cool and calm mind. Romance may be unstable during the year. Mix-blessings but not so good year. If starting a new business with a partner, try to clear-up all the terms before committing to the venture. Do not be hasty in making decisions in the year. Generally a good year, but look after health. Try to take advantage of lots of wealth opportunities. Try not to let others take advantage of your good nature. Monkey offends Tai Sui, whatever one does, will generally not be smooth in this year. Difficult to retain money and may go into financial difficulties in business. Remarks: Travelling and Health Issues. Do not be too hasty in career decisions. Avoid long distance overseas trip(s) if possible due to robbery and theft. Remarks: Finance & Health Issues. Be careful of getting cheated. Remarks: Career not smooth, avoid investments. For overseas trip be careful of robbery. Family quarrels. For females, look after your health. There can be some unexpected winnings but is not enough to cover the outflow of expenditure. Remarks: Career not smooth, be careful of Finance. Best to avoid changing jobs this year. Husband and wives may get into more quarrels, this year. Be careful of road accidents. Remarks: Year of mix-blessings, need to be cautious. Don't let your heart rule over your mind, else may get into financial entanglements. Avoid becoming a guarantor else may be involved in legal entanglements. Overall good career luck. Generally a mixed-blessing year for the rooster. Rooster tends to `fly' its way through recklessly. So if one does not have self-control, things might not go smoothly. Career luck can be extremely good for the rooster, this year. Will be a busy year. There are wealth opportunities and unexpected winnings. However, try to save money.